Welcome to this, the fourth chapter, in "7 Bites". In this section we're going to explore how you can (optionally) set up your participants and organise these into groups. Why? Of course, you can just allow participants to access your activities by using a temporary "Alias", or nickname. In the absence of pre-registered participants, enabling access using "alias" is the default setting. This is ideal either for audiences which you cannot conveniently pre-enrol (for example unknown members of the public), or in cases where your participants might want to remain anonymous. However, pre-registering your participants (when possible) has the added advantage of securely identifying them. This means that you will be able to extract reports on participant progress over multiple sessions as well as attendance and engagement reports by participant. The participant experience is also slightly improved. To get started, visit the The Participants Tab in your QF site. 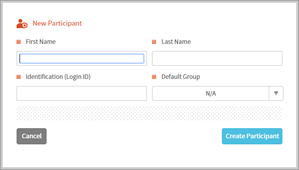 This is where you can create and edit Participants and Groups, or to import these in bulk using a CSV file. For example, you might choose to import an entire school or faculty roll of students, complete with their course or class memberships. Or, you might prefer to "enroll" participants one at a time and later organise them into groups to suit your needs. Creating Participants On clicking the "Create Participant" button, you'll be presented with a form in which to enter the first and last name of the Participant (these are compulsory fields). You may also enter a unique ID here; whilst this is not compulsory, it is very useful as this permits a Facilitator to manage access to activities using either ID or group membership. ID must be unique and may be any combination of alphabetic and numeric characters (case is sensitive). You might choose to join this participant to a group now; otherwise leave this step until later when you might select group members from a large participant list. On selecting "Create Participant", you return to the Participants page with your new Participant included. 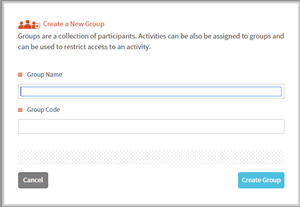 Creating Groups In just the same way, you can press the "Create Groups" button on the right hand side of the Participants page and complete the resulting form. It's as simple as giving the Group a name (the label by which it will be identified in reports and lists) and a unique Group code. (Note: When giving names to Groups, keep in mind how these will appear in reports and lists. Be aware also that Groups are (by default) shared across the entire institution and are visible to other Facilitators. It's best to make the name a clear identifier and one you will find quickly within a long list. When launching a Peer Assessment, by pressing the "Import Group" or "Import Teamset" buttons on the launch form. The same CSV file format applies to all imports. The column headings used on the CSV file are critical, and must be identical to those shown below. group_code - Optional field. The code for the group (ie course or class) into which the participant is being enrolled. If the participant is in multiple groups, supply a separate line for each group in which the participant is a member. team - Optional field. The name of the team in which the participant is a member. email - Optional field. The participant's email. The order of the columns is not important. Columns containing non-compulsory and unwanted data may be ommitted from the import CSV file. Some data is critical (id, first, last) and the import will not succeed without that data. Some data ('team') is dependant on other data ('group_code'), so if participants are to be organised into teams then they must be assigned to a group. Every participant must have a first name ('first'), last name ('last') and ID ('id'). If the Participant will be involved in Peer Assessment activities, then the Participant's email must be provided (if it is not, then the import will succeed but the Peer Assessment activities will fail). It is best practice for participants to be assigned to at least one group; much of the reporting functionality in Xorro-Q revolves around group membership and not including this may significantly detract from data analysis options. For participants to be assigned to teams, they must be in a group. Where a group contains participants assigned to teams, then all participants in the group must be in a team. The participant can be a member of only one team in the same group. A participant may belong to different teams in different groups. Where a participant is a member of multiple groups, or of multiple teams in different groups, this is represented in this file as multiple rows for this participant, with duplicate "id", "first" and "last" entries, one row for each group_code & team. Xorro will automatically neglect any duplicate entries, but add or edit any new group or team memberships. In either case, a preview of the uploaded data will be displayed. If the data includes multiple groups and teams then the user can select a group and a teamset (if relevant) and preview its data. The import can be cancelled at this point, or advanced by pressing the "Import" button at the foot of the preview form. Once the import is progressed, the group(s) imported will be visible and may be edited as usual from within the Participants tab. Coming up: In the next installment "Bite" we'll be taking a deeper look at running activities. By then you'll probably already have some experience with running activities with audiences.... We'll be looking at tips and tricks which will save you time and effort. As always, feel free to read ahead!